The Apollo Guidance Computer (AGC) provided guidance, navigation and control onboard the Apollo flights to the Moon. This historic computer was one of the first to use integrated circuits, containing just two types of ICs: a 3-input NOR gate for the logic circuitry and a sense amplifier IC for the memory. It also used numerous analog circuits built from discrete components using unusual cordwood construction. The Apollo Guidance Computer. The empty space on the left held the core rope modules. The connectors on the right communicate between the AGC and the spacecraft. By removing the bolts holding the two trays together, we could disassemble the AGC. Pulling the two halves apart takes a surprising amount of force because of the three connectors in the middle that join the two trays. The tray on the left is the "A" tray, which holds the logic and interface modules. The tangles of wire on the left of the tray are the switching power supplies that convert 28 volts from the spacecraft to 4 and 14 volts for use in the AGC. The tray on the right is the "B" tray, which holds the memory circuitry, oscillator and alarm. The core memory module was removed in this picture; it goes in the empty slot in the middle of the B tray. The AGC is implemented with dozens of modules in two trays. The trays are connected through the three connectors in the middle. 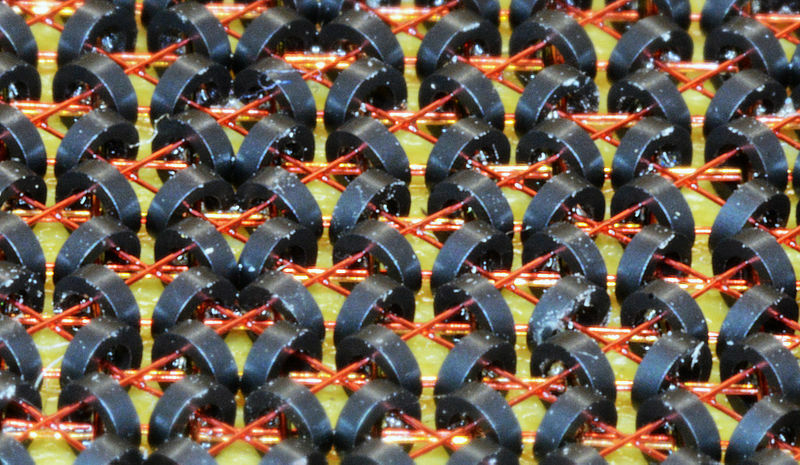 Closeup of a core memory (not AGC). Photo by Jud McCranie (CC BY-SA 4.0). Each core stored a bit by being magnetized either clockwise or counterclockwise. A current in a wire through the core could magnetize the core with the magnetization direction matching the current's direction. To read the value of a core, the core was flipped to the 0 state. If the core was in 1 state previously, the changing magnetic field produced a voltage in the sense wire threaded through the cores. But if the core was in the 0 state to start, the sense line wouldn't pick up a voltage. Thus, forcing a core to 0 revealed the core's previous state (but erased it in the process). A key property of the cores was hysteresis: a small current had no effect on a core; the current had to be above a threshold to flip the core. This was very important because it allowed a grid of X and Y lines to select one core from the grid. By energizing one X line and one Y line each with half the necessary current, only the core where both lines crossed would get enough current to flip and other cores would be unaffected. 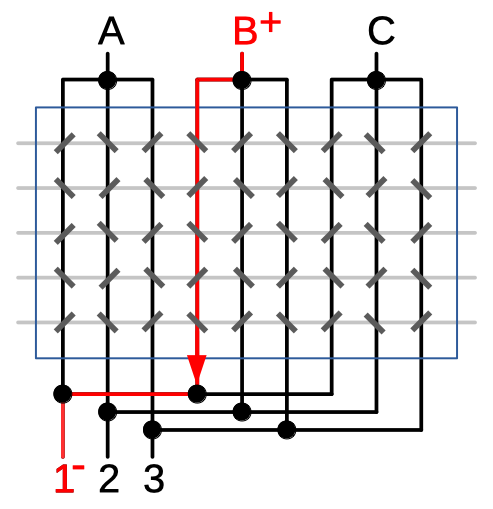 This "coincident-current" technique made core memory practical since a few X and Y drivers could control a large core plane. The AGC used multiple modules in the B tray to implement core memory. The Erasable Memory module (B12) contained the actual cores, 32768 cores to support 2048 words; each word was 15 bits plus a parity bit. Several more modules contained the supporting circuitry for the memory.5 The remainder of this article will describe these modules. 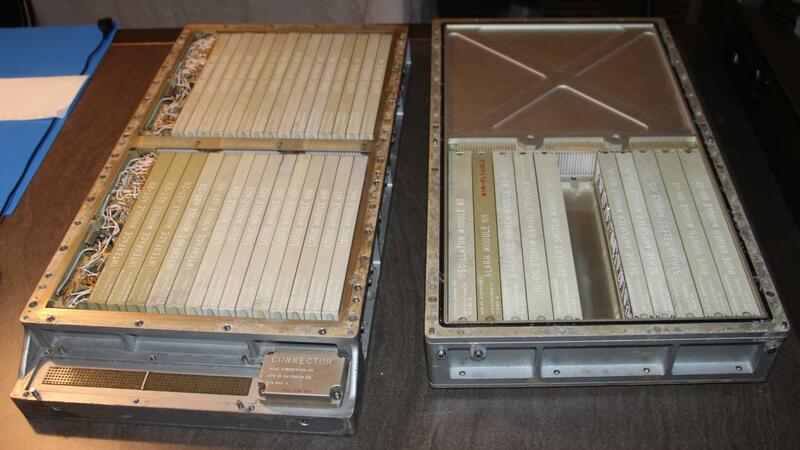 The erasable memory module in the Apollo Guidance Computer, with the supporting modules next to it. Image courtesy of Mike Stewart. The photo below shows the Erasable Memory module after removing it from the tray. Unlike the other modules, this module has a black metal cover. Internally, the cores are encapsulated in Silastic (silicone rubber), which is then encapsulated in epoxy. This was intended to protect the delicate cores inside, but it took NASA a couple tries to get the encapsulation right. 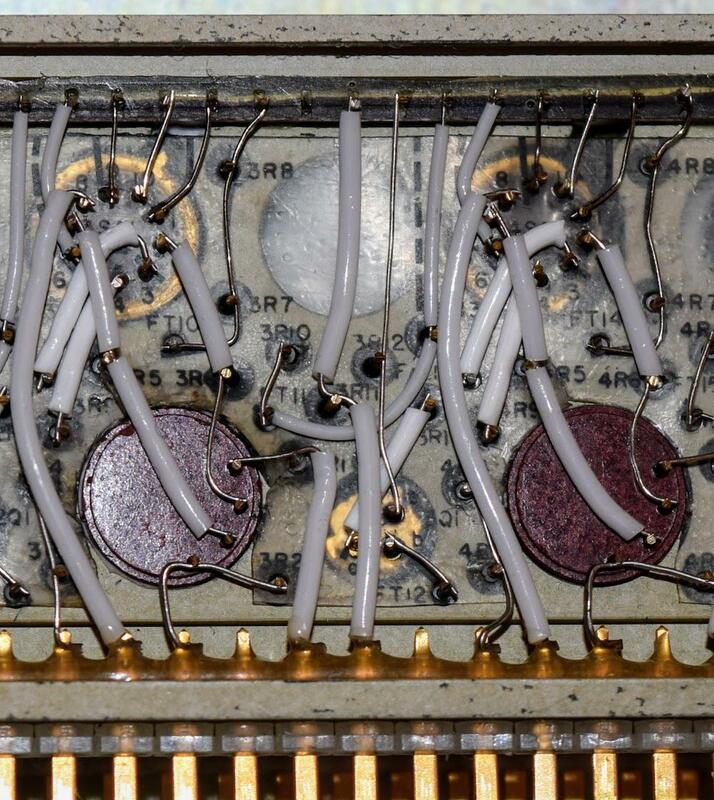 Early modules (including ours) were susceptible to wire breakages from vibrations. 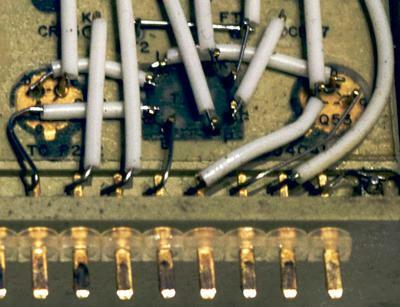 At the bottom of the modules are the gold-plated pins that plug into the backplane. The erasable core memory module from the Apollo Guidance Computer. Core memory used planes of cores, one plane for each bit in the word. The AGC had 16 planes (which were called mats), each holding 2048 bits in a 64×32 grid. Note that each mat consists of eight 16×16 squares. The diagram below shows the wiring of the single sense line through a mat. The X/Y lines were wired horizontally and vertically. The inhibit line passed through all the cores in the mat; unlike the diagonal sense line it ran vertically. The sense line wiring in an AGC core plane (mat). The 2048 cores are in a 64×32 grid. Most computers physically stacked the core planes on top of each other but the AGC used a different mechanical structure, folding the mats (planes) to fit compactly in the module. 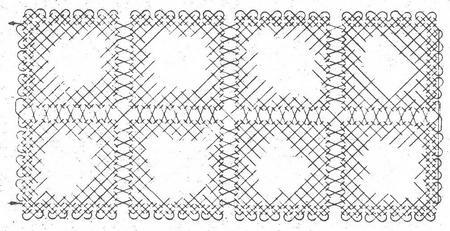 The mats were accordion-folded to fit tightly into the module as shown in the diagram below. 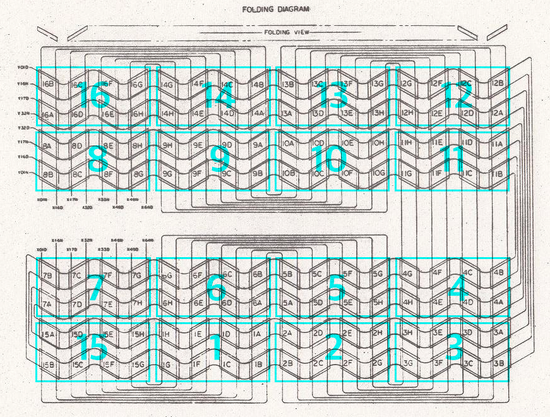 (Each of the 16 mats is outlined in cyan.) 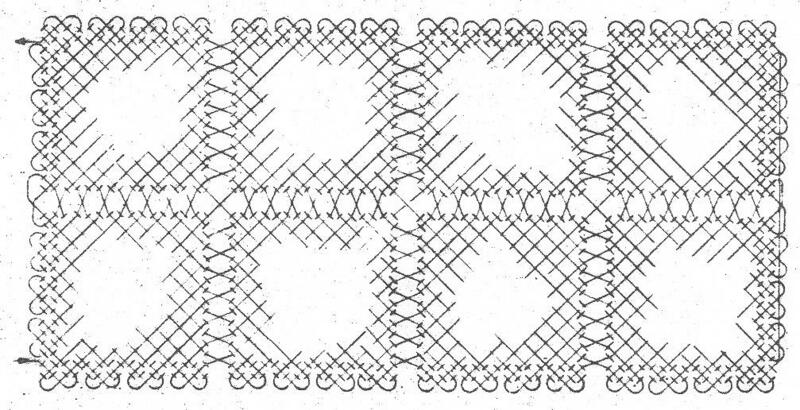 When folded, the mats formed a block (oriented vertically in the diagram below) that was mounted horizontally in the core module. 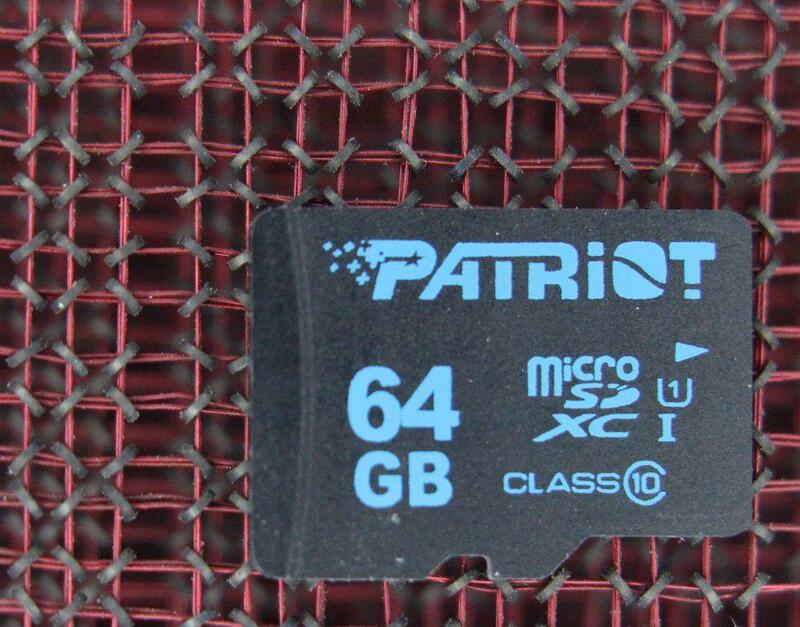 The photo below shows the memory module with the cover removed. (This is a module on display at the CHM, not our module.) 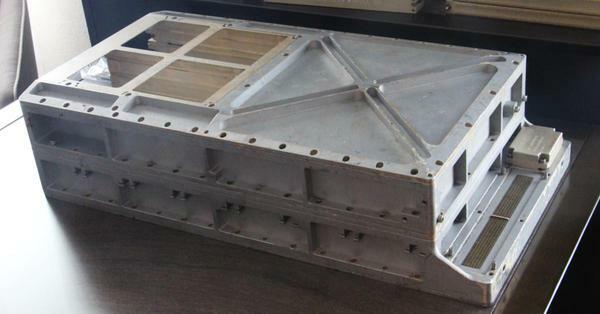 Most of the module is potted with epoxy, so the cores are not visible. The most noticeable feature is the L-shaped wires on top. These connect the X and Y pins to 192 diodes. (The purpose of the diode will be explained later.) The diodes are hidden underneath this wiring in two layers, mounted horizontally cordwood-style. The leads from the diodes are visible as they emerge and connect to terminals on top of the black epoxy. The AGC's memory module with the cover removed. This module is on display at the CHM. Photo courtesy of Mike Stewart. Marc took X-rays of the module and I stitched the photos together (below) to form an image looking down into the module. 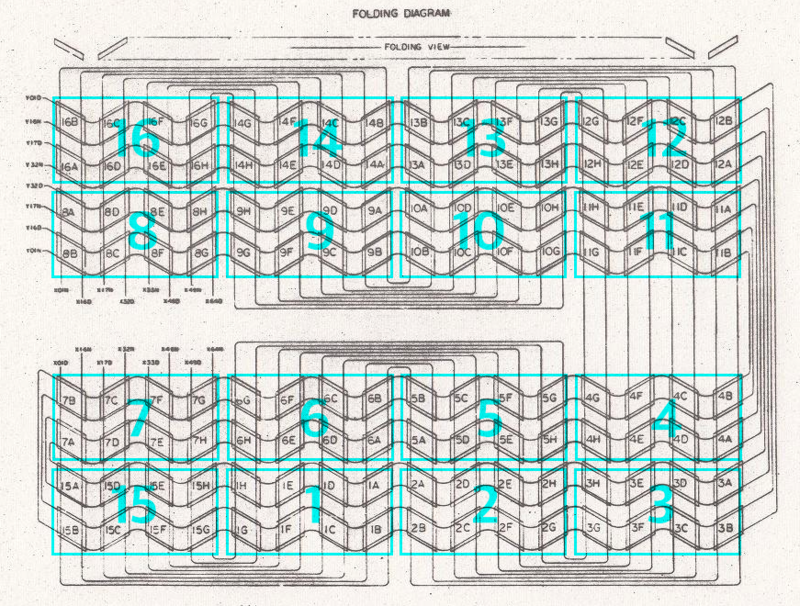 The four rows of core mats in the folding diagram correspond to the four dark blocks. 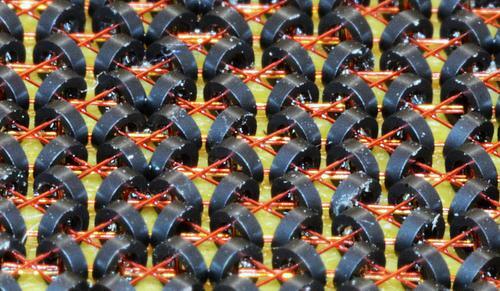 You can also see the two rows of diodes as two darker horizontal stripes. At this resolution, the wires through the cores and the tangled mess of wires to the pins are not visible; these wires are very thin 38-gauge wires, much thinner than the wires to the diodes. Composite X-ray image of the core memory module. The stitching isn't perfect in the image because the parallax and perspective changed in each image. In particular, the pins appear skewed in different directions. 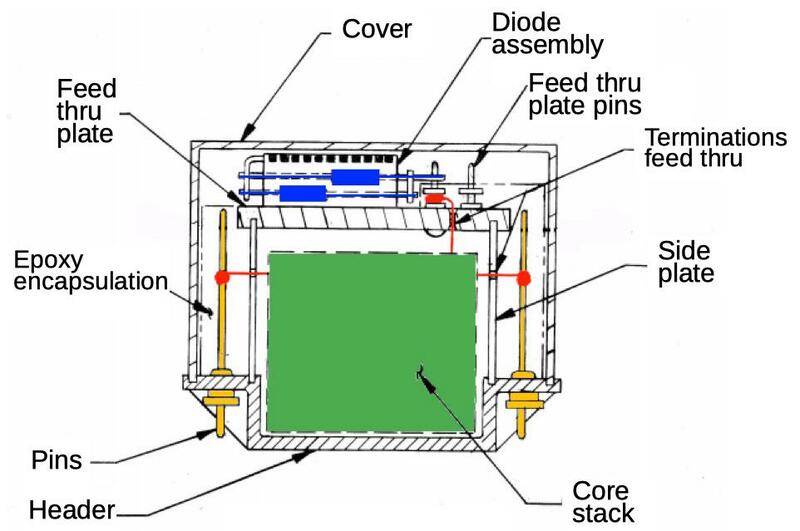 The diagram below shows a cross-section of the memory module. (The front of the module above corresponds to the right side of the diagram.) The diagram shows how the two layers of diodes (blue) are arranged at the top, and are wired (red) to the core stack (green) through the "feed thru". Also note how the pins (yellow) at the bottom of the module rise up through the epoxy and are connected by wires (red) to the core stack. The AGC's core memory holds 2048 words in a 64×32 matrix. To select a word, one of the 64 X select lines is energized along with one of the 32 Y select lines. One of the challenges of a core memory system is driving the X and Y select lines. These lines need to be driven at high current (100's of milliamps). In addition, the read and write currents are opposite directions, so the lines need bidirectional drivers. Finally, the number of X and Y lines is fairly large (64 + 32 for the AGC), so using a complex driver circuit on each line would be too bulky and expensive. In this section, I'll describe the circuitry in the AGC that energizes the right select lines for a particular address. Illustration of how "top" and "bottom" drivers work together to select a single line through the core matrix. Original diagram here. The diagram above demonstrates this technique for the vertical lines in a hypothetical 9×5 core array. There are three "top" drivers (A, B and C), and three "bottom" drivers (1, 2 and 3). If driver B is energized positive and driver 1 is energized negative, current flows through the core line highlighted in red. Reversing the polarity of the drivers reverses the current flow, and energizing different drivers selects a different line. To see the need for diodes, note that in the diagram above, current could flow from B to 2, up to A and finally down to 1, for instance, incorrectly energizing multiple lines. Much of the address decoding is implemented in logic module A14. Photo courtesy of Mike Stewart. The diagram below shows the circuit to generate one of the select signals (XB6—X bottom 6).11 The NOR gate outputs a 1 if the inputs are 110 (i.e. 6). The other select signals are generated with similar circuits, using different address bits as inputs. This address decode circuit generates one of the select signals. The AGC has 28 decode circuits similar to this. Each integrated circuit implemented two NOR gates using RTL (resistor-transistor logic), an early logic family. These ICs were costly; they cost $20-$30 each (around $150 in current dollars). There wasn't much inside each IC, just three transistors and eight resistors. Even so, the ICs provided a density improvement over the planned core-transistor logic, making the AGC possible. The decision to use ICs in the AGC was made in 1962, amazingly just four years after the IC was invented. The AGC was the largest consumer of ICs from 1962 to 1965 and ended up being a major driver of the integrated circuit industry. Each IC contains two NOR gates implemented with resistor-transistor logic. From Schematic 2005011. The die photo below shows the internal structure of the NOR gate; the metal layer of the silicon chip is most visible.12 The top half is one NOR gate and the bottom half is the other. The metal wires connect the die to the 10-pin package. 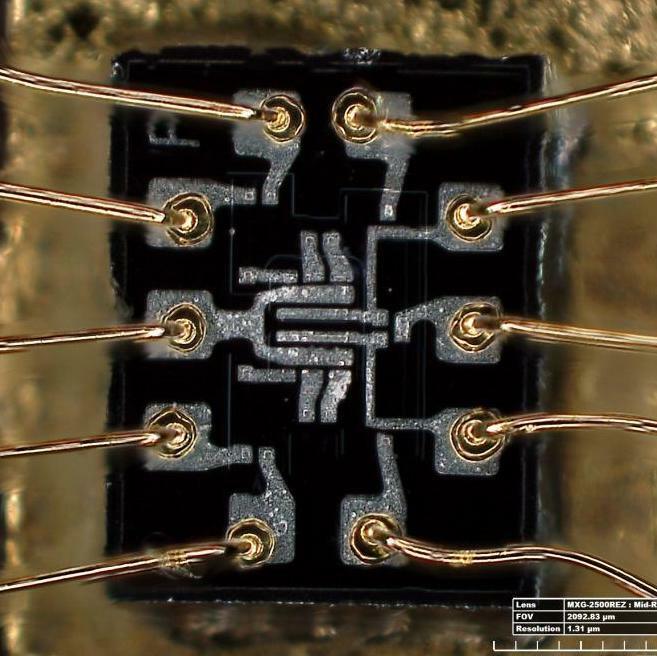 The transistors are clumped together in the middle of the chip, surrounded by the resistors. 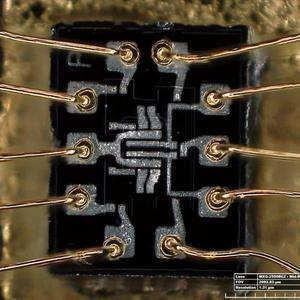 Die photo of the dual 3-input NOR gate used in the AGC. Pins are numbered counterclockwise; pin 3 is to the right of the "P". Photo by Lisa Young, Smithsonian. Next, the Erasable Driver module converts the 4-volt logic-level signals from the address decoder into 14-volt pulses with controlled current. The AGC has two identical Erasable Driver modules, in slots B9 and B10.5 Two modules are required due to the large number of signals: 28 select lines (X and Y, top and bottom), 16 inhibit lines (one for each bit), and a dozen control signals. The select line driver circuits are simple transistor switching circuits: a transistor and two resistors. Other circuits, such as the inhibit line drivers are a bit more complex because the shape and current of the pulse need to be carefully matched to the core module. This circuit uses three transistors, an inductor, and a handful of resistors and diodes. The resistor values are carefully selected during manufacturing to provide the desired current. The erasable driver module, front and back. Photo courtesy of Mike Stewart. This module, like the other non-logic modules, is built using cordwood construction. In this high-density construction, components were inserted into holes in the module, passing through from one side of the module to the other, with their leads exiting on either side. (Except for transistors, with all three leads on the same side.) On each side of the module, point-to-point wiring connected the components with welded connections. In the photo below, note the transistors (golden, labeled with Q), resistors (R), diodes (CR for crystal rectifier, with K indicating the cathode), large capacitors (C), inductor (L), and feed-throughs (FT). A plastic sheet over the components conveniently labels them; for instance, "7Q1" means transistor Q1 for circuit 7 (of a repeated circuit). These labels match the designations on the schematic. At the bottom are connections to the module pins. Modules that were flown on spacecraft were potted with epoxy so the components were protected against vibration. Fortunately, our AGC was used on the ground and left mostly unpotted, so the components are visible. A closeup of the Erasable Driver module, showing the cordwood construction. Photo courtesy of Mike Stewart. You might expect that the 14-volt pulses from the Erasable Driver modules would drive the X and Y lines in the core. However, the signals go through one more module, the Current Switch module, in slot B11 just above the core memory module. This module generates the bidirectional pulses necessary for the X and Y lines. The driver circuits are very interesting as each driver includes a switching core in the circuit. (These cores are much larger than the cores in the memory itself. )13 The driver uses two transistors: one for the read current, and the other for the write current in the opposite direction. The switching core acts kind of like an isolation transformer, providing the drive signal to the transistors. But the switching core also "remembers" which line is being used. During the read phase, the address decoder flips one of the cores. This generates a pulse that drives the transistor. During the write phase, the address decoder is not involved. Instead, a "reset" signal is sent through all the driver cores. Only the core that was flipped in the previous phase will flip back, generating a pulse that drives the other transistor. 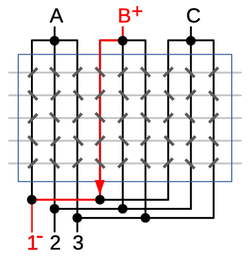 Thus, the driver core provides memory of which line is active, avoiding the need for a flip flop or other latch. The current switch module. (This is from the CHM as ours is encapsulated and there's nothing to see but black epoxy.) Photo courtesy of Mike Stewart. The diagram below shows the schematic of one of the current switches. The heart of the circuit is the switching core. 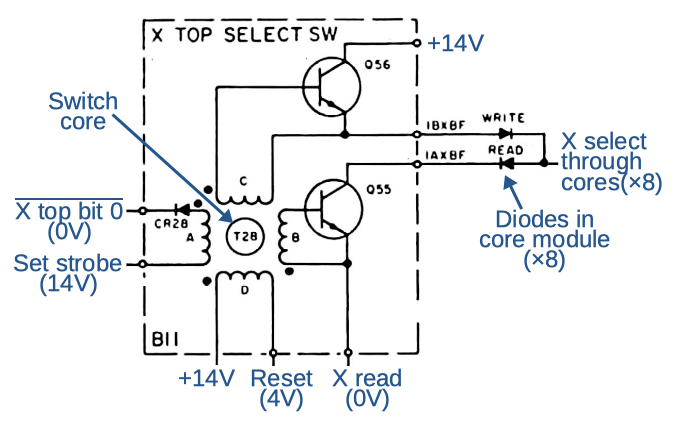 If the driver input is 1, winding A will flip the the core when the set strobe is pulsed. This will produce a pulses on the other windings; the positive pulse on winding B will turn on transistor Q55, pulling the output X line low for reading.14 The output is connected via eight diodes to eight X top lines through the core. A similar bottom select switch (without diodes) will pull X bottom lines high; the single X line with the top low and the bottom high will be energized, selecting that row. For a write, the reset line is pulled low energizing winding D. If the core had flipped earlier, it will flip back, generating a pulse on winding C that will turn on transistor Q56, and pull the output high. But if the core had not flipped earlier, nothing happens and the output remains inactive. As before, one X line and one Y line through the core planes will be selected, but this time the current is in the opposite direction for a write. Schematic of one of the current switches in the AGC. This switch is the driver for X top line 0. The schematic shows one of the 8 pairs of diodes connected to this driver. The photo below shows one of the current switch circuits and its cordwood construction. The switching core is the 8-pin black module between the transistors. The core and the wires wound through it are encapsulated with epoxy, so there's not much to see. 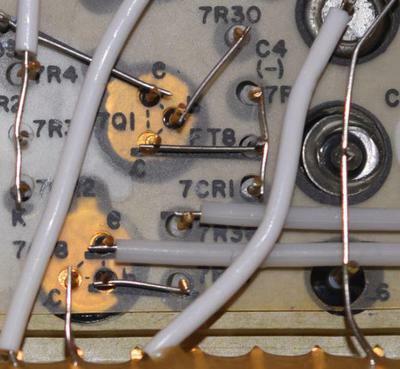 At the bottom of the photo, you can see the Malco Mini-Wasp pins that connect the module to the backplane. Closeup of one switch circuit in the Current Switch Module. The switching core (center) has transistors on either side. When a core flips, the changing magnetic field induces a weak signal in the corresponding sense line. There are 16 sense lines, one for each bit in the word. The 16 sense amplifiers receive these signals, amplify them, and convert them to logic levels. 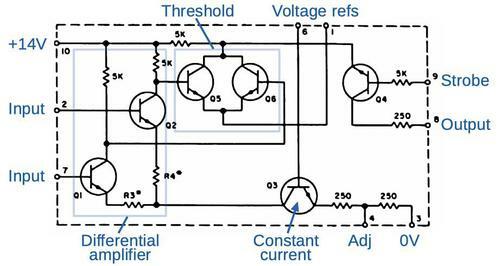 The sense amplifiers are implemented using a special sense amplifier IC. (The AGC used only two different ICs, the sense amplifier and the NOR gate.) The AGC has two identical sense amplifier modules, in slots B13 and B14; module B13 is used by the erasable core memory, while B14 is used by the fixed memory (i.e. core rope used for ROM). 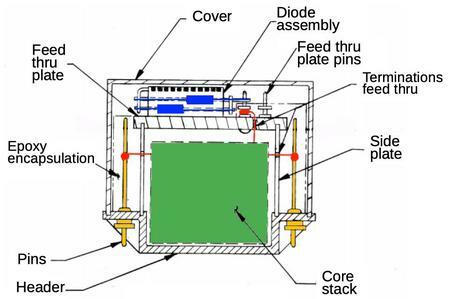 The signal from the core first goes through an isolation transformer. It is then amplified by the IC and the output is gated by a strobe transistor. 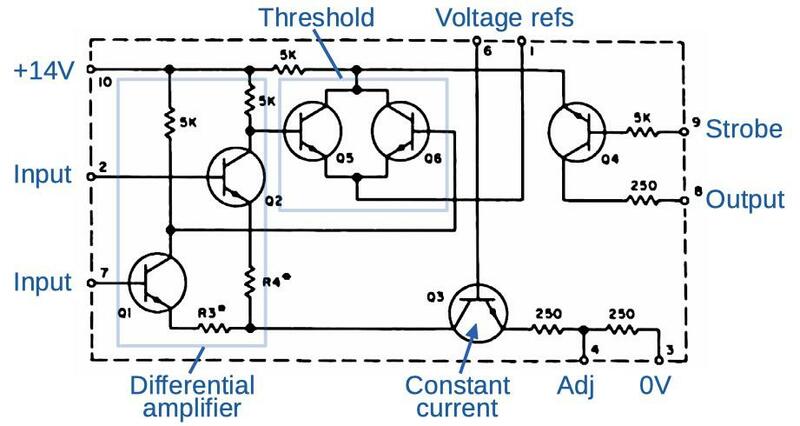 The sense amplifier depends on carefully-controlled voltage levels for bias and thresholds. These voltages are produced by voltage regulators on the sense amplifier modules that use Zener diodes for regulation. The voltage levels are tuned during manufacturing by selecting resistor values and optional diodes, matching each sense amplifier module to the characteristics of the computer's core memory module. The photo below shows one of the sense amp modules. The eight repeated units are eight sense amplifiers; the eight other sense amplifiers are on the other side of the module. The reddish circles are the pulse transformers, while the lower circles are the sense amplifier ICs. The voltage regulation is in the middle and right of the module. On top of the module (front in the photo) you can see the horizontal lines of the nickel ribbon that connects the circuits; it is somewhat similar to a printed circuit board. Sense amplifier module with top removed. Note the nickel ribbon interconnect at the top of the module. The photo below shows a closeup of the module. At the top are two amplifier integrated circuits in metal cans. Below are two reddish pulse transformers. An output driver transistor is between the pulse transformers.15 The resistors and capacitors are mounted using cordwood construction, so one end of the component is wired on this side of the module, and one on the other side. Note the row of connections at the top of the module; these connect to the nickel ribbon interconnect. Closeup of the sense amplifier module for the AGC. The sense amplifier integrated circuits are at the top and the reddish pulse transformers are below. The pins are at the bottom and the wires at the top go to the nickel ribbon, which is like a printed circuit board. The diagram below shows the circuitry inside each sense amp integrated circuit. The sense amp chip is considerably more complex than the NOR gate IC. The chip receives the sense amp signal inputs from the pulse transformer and the differential amplifier amplifies the signal.16 If the signal exceeds a threshold, the IC outputs a 1 bit when clocked by the strobe. Circuitry inside the sense amp integrated circuit for the AGC. With core memory, the read operation and write operation are always done in pairs. Since a word is erased when it is read, it must then be written, either with the original value or a new value. In the write cycle, the X and Y select lines are energized to flip the core to 1, using the opposite current from the read cycle. Since the same X and Y select lines go through all the planes, all bits in the word would be set to 1. To store a 0 bit, each plane has an inhibit line that goes through all the cores in the plane. Energizing the inhibit line in the opposite direction to the X and Y select lines partially cancels out the current and prevents the core from receiving enough current to flip it, so the bit remains 0. Thus, by energizing the appropriate inhibit lines, any value can be written to the word in core. The 16 inhibit lines are driven by the Erasable Driver modules. During the restoration, we tested the continuity of all the lines through the core module. Unfortunately, we discovered that the inhibit line for bit 16 is broken internally. NASA discovered in early testing that wires could be sheared inside the module, due to vibrations between the silicone encapsulation and the epoxy encapsulation. They fixed this problem in the later modules that were flown, but our module had the original faulty design. We attempted to find the location of the broken wire with X-rays, but couldn't spot the break. Time-domain reflectometry suggests the break is inconveniently located in the middle of the core planes. We are currently investigating options to deal with this. Marc has a series of AGC videos; the video below provides detail on the broken wire in the memory module. Core memory was the best storage technology in the 1960s and the Apollo Guidance Computer used it to get to the Moon. In addition to the core memory module itself, the AGC required several modules of supporting circuitry. The AGC's logic circuits used early NOR-gate integrated circuits, while the analog circuits were built from discrete components and sense amplifier ICs using cordwood construction. The erasable core memory in the AGC stored just 2K words. Because each bit in core memory required a separate physical ferrite core, density was limited. Once semiconductor memory became practical in the 1970s, it rapidly replaced core memory. The image below shows the amazing density difference between semiconductor memory and core memory: 64 bits of core take about the same space as 64 gigabytes of flash. Core memory from the IBM 1401 compared with modern flash memory. I announce my latest blog posts on Twitter, so follow me @kenshirriff for future articles. I also have an RSS feed. See the footnotes for Apollo manuals17 and more information sources18. Thanks to Mike Stewart for supplying images and extensive information. The AGC restoration team consists of Mike Stewart (creator of FPGA AGC), Carl Claunch, Marc Verdiell (CuriousMarc) on YouTube and myself. The AGC that we're restoring belongs to a private owner who picked it up at a scrap yard in the 1970s after NASA scrapped it. For simplicity I refer to the AGC we're restoring as "our AGC". 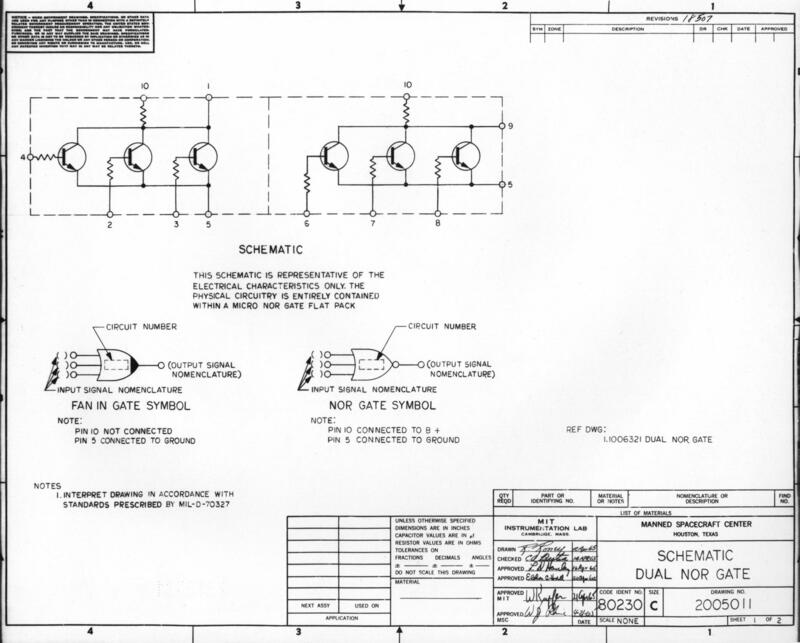 For more information on the AGC, the Virtual AGC site has tons of information on the AGC, in particular the ElectroMechanical page has lots of schematics and drawings. There's a video of Eldon Hall, designer of the AGC, disassembling our AGC in 2004. If you want to try a simulated AGC in your browser, see moonjs. I am facing the best technology history website. This article is from Dreams! Thank you very much for making this excellent material available. I'm overloaded with so much information (warniings 1201, 1202 both), thanks Ken. Could you take two X-rays from slightly different angles, and make a stereoscopic pair? This would make the layers stand out much more clearly. I realise it wouldn't fit the entire module in one picture, but even a closeup 3D look at the middle of the module would be informative. I worked at Ampex Computer Products Division in Culver City from January 1964 until about 1971 in manufacturing. It was in the hay day of core memories. We built many core memory planes and stacks for a verity of companies. We did not do any work for the Apollo program but we did some for companies that supported the Space Program including some that were installed in the launch complex building upon which the missile was installed. I have first hand knowledge of the manufacturing methods used to stabilize the core memory planes from he effects of vibration. The plane would test ok before encapsulating but some would fail afterward. It turned out that the routing of the sense wires was critical. They could not be tightly twisted and only a loose twist would work. Many hours of rework occurred be for I was able to solve the problem. Since one of the bits of each data word is parity, could you synthesize replacement data on the fly for the bad bit from the other 15? 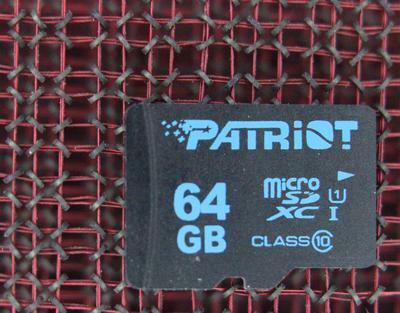 Interesting sleuthing on historic hardware. Good luck! No, parity would indicate an error but there is no way of telling which bit including the parity bit is wrong. The images in the article itself are blurry and upscaled (on my HiDPI screen) so I thought the originals were just unfortunately crappy. Until you talked about a 'flow diagram [of the Model 50]', which I couldn't spot, until... snap, the images are clickable! And are actually of a higher resolution.